The $10k No Limit Holdem Championship is down to just two players after officials called a stop to the action due to the 10-Level Rule, both with their eyes set on their first World Series of Poker bracelet and the biggest first-place prize of the 2011 WSOP thus far, a $1.1 million payday. The two players who will be returning to the Rio on Thursday are chip-leader Joe Ebanks and online poker legend Chris “Moorman1” Moorman, who are the survivors of a very, very, tough final table that saw a slew of the games young stars battle it out. 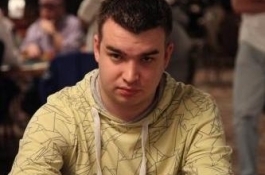 Moorman, yet another young UK poker phenom, is in the conversation of “Best Online Tournament Player of All-Time” having won the PocketFives Triple Crown an astounding 11 times, and having won virtually every weekly guaranteed online poker tournament. Just missing the final table was WSOP POY leader Ben Lamb who finished in 12th place, but in the process exceeded 500 points in the POY race –an important number since the winner of the WSOP Main Event will receive 500 points this year. This entry was posted on Thursday, June 30th, 2011 at 8:23 am and is filed under Poker News. You can follow any responses to this entry through the RSS 2.0 feed. You can leave a response, or trackback from your own site.